Actor Sarah Gordy, who has Down’s syndrome, will be awarded an honorary doctorate from the University of Nottingham next month. Ms Gordy has appeared in Call the Midwife and Upstairs Downstairs and is believed to be one of the first people with the syndrome to receive an honorary degree from a UK university. Helen Laverty, professional lead for learning disability nursing at the university’s faculty of medicine and health sciences, said Ms Gordy has ‘challenged preconceptions’ of what is possible for people with a learning disability. ‘Through her critically acclaimed performances, Sarah is forcing not only the acting community to question their attitude to disability but society as a whole. She provides a powerful example of why more people with a learning disability should be on our screens. 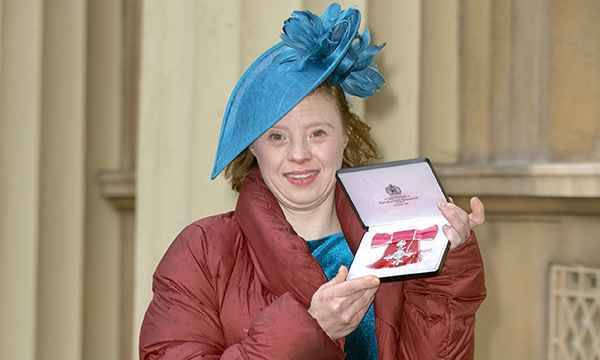 Earlier this month, the Mencap ambassador became the first woman with Down’s syndrome to be made an MBE. She was recognised for her services to the arts and people with disabilities.